Michelle Piyapattra won the season opening event for the second year in a row on Wednesday (May 27). A native of Corona, California, she shot a final round of 69 (-3) at the Glencoe Golf & Country Club in Calgary to win the title. She earned $10,000 for the win and an exemption into the 2015 Canadian Pacific Women’s Open. In a share of 5th place Kirby Dreher of British Columbia was the low Canadian. Former Ottawa resident Grace Howie, playing as an amateur, tied for 29th. Fellow Amateur Grace St-Germain of Ottawa tied for 41st. Hannah Hellyer of Quinte West (ON) finished is a share of 62nd. The next stop for the tour is at the Smiths Falls Golf & Country Club on June 16/17, 2015. The PGA TOUR and Mackenzie Investments announced a six year agreement on May 27th that will see the company become the new umbrella sponsor for the Mackenzie Tour – PGA TOUR Canada. the deal with the investment firm was announced on the eve of the opening event of the year for the tour, the PC Financial Open in Vancouver. A year ago Nick Kenney was sitting in the clubhouse with a lead when Billy Walsh stormed in with a 66 to force a playoff at the PGA of Ontario Spring Open. Kenney would come out on the losing end of that deal. 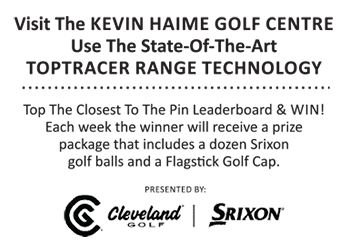 Kenney, a staff member at The National Golf Club of Canada, avoided that happening again on May 27th with impressive play at the Taboo Resort & Golf Club by posting scores of 68-70 for the victory. He fought off rain and bugs over two rounds to win the first major of the year on the PGA of Ontario calendar. Simultaneously, the PGA of Ontario Women’s Spring Open saw Alexa Kim (Uplands Golf Club) put on a clinic, shredding through the over 6000 yard setup carding a 71, 72, 1-over to win the Open by eleven shots over second place Jennifer Jaszek (South Muskoka Golf & CC). The PGA of Ottawa will host their Spring Open on June 8th at the Eagle Creek Golf Club in Dunrobin, Ontario. On Sunday, May 31st, the Metcalfe Golf Club in Metcalfe, Ontario will host a Kids Clinic, Family BBQ & Golf. The fun begins at 4 p.m. with a Children’s Golf Clinic with a PGA of Canada Professional with information available at that time on the Metcalfe Golf Junior & Family Programs. At 5 p.m participants can enjoy a burger or hot dog off the BBQ with chips, vegetables, and dessert available. Manotick, Ontario’s Brad Fritsch begins play today at the Web.com Tour Rex Hospital Open in Raleigh, North Carolina. He tees off for the 1st round at 12:20 p.m. Other Canadians in the field are Ryan Yip of Calgary and Ted Brown of Peterborough. The LPGA Tour begins play on Friday this week for the Shoprite LPGA Classic in Galloway, New Jersey. In the field from Canada are Brooke Henderson, Sue Kim, Alena Sharp and Soo Bin Kim. The PGA Tour is in Texas this week for the AT&T Byron Nelson. Canadians in the field include Graham DeLaet, Mike Weir, Adam Hadwin, Austin Connelly, and Roger Sloan. The Golf Quebec Spring Open will be played Friday, May 29th. Yvan Beauchemin defends his title in the 86th playing of the event held at Beaconsfield Golf Club, There are 129 players in the field.